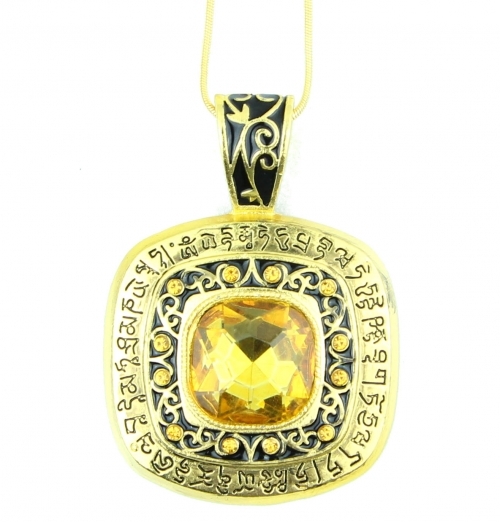 Embedded with one big yellow jewel and surrounded by auspicious Sutra, this lovely beautiful squared shaped Wish Granting can increase your determination and confidence needed to attract prosperity and fulfill all your wishes ! The golden wish is detailed with intricacy, designed to have a good fortune mantra along the sides, and can be worn by men, women, and children, alike. Carry The wish granting frequently to activate your Money Bags Star, accumulate your fortune luck, increase your scholastic success, and personal growth. 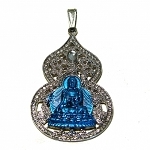 The diameter of wish granting pendant itself is approx. 1.5" x 1.5" x 0.5". It includes one chain.